Rag&Bone have such a cool, effortless chic about their line, I look forward to seeing what they will create every season. For Fall 2014 they are showing midi length skirts, high waisted shorts and pants, easy blazers and cool outerwear. 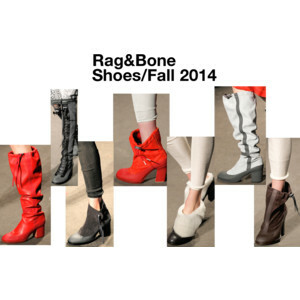 Rag&Bone launched their footwear line in 2009 and its a great thing that they did. They have become known equally for their cool clothes as the have for their footwear. Last year it was the Harrow Booties that popped up on Fashionistas everywhere and this year there are seven great styles to choose from. I am loving the chunkier heels and the slouchy, knee high boots.